Cats with diabetes are prone to urinary tract infections (UTIs), but non-diabetic cats are also at risk. Symptoms of a UTI include the cat urinating in the house (not using the litterbox), straining to urinate, frequent urination, licking the genital area, and blood in the urine. However, some cat urinary infections will only cause vague symptoms such as decreased activity level, loss of appetite, or vomiting. Because diabetes suppresses the immune system, diabetic cats are more susceptible to various infections. Bladder infections are common, because the body ‘dumps’ excess glucose (sugar) into the urine, where it provides an energy source for any bacteria present. 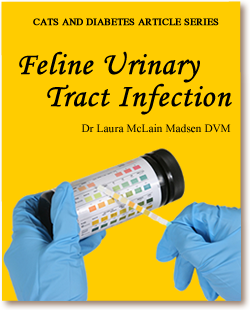 It’s important to promptly diagnose and treat feline UTIs, not only for the cat’s comfort but also because the inflammatory response interferes with the body’s use of insulin. An untreated urinary infection in a diabetic cat can lead to deregulation of the diabetes, diabetic ketoacidosis (DKA), pyelonephritis (kidney infection) and serious illness. If you suspect your cat has a UTI, the first step is to have a urinalysis run by your veterinarian. Your veterinarian can collect a fresh urine sample via cystocentesis (a needle inserted into the bladder). Urine samples can also be obtained with special non-absorbent ‘fake’ kitty litters, or by having the cat urinate directly into a clean container, such as a sterilized jar or new Ziploc® bag. 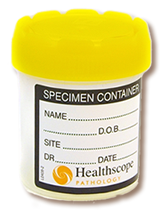 A urinalysis (or UA) involves checking the urine pH and specific gravity (an indicator of kidney function); testing for glucose, ketones and protein; and looking at the urine under a microscope for crystals, blood cells and bacteria. Even if the UA looks ‘clean’, your veterinarian may recommend a urine bacterial culture. A culture provides the definitive diagnosis of a feline bladder infection, including the bacterial type and its sensitivity to various antibiotics. The antibiotic sensitivity allows veterinarians to choose the most effective medication for treatment for UTI in cats. If a bladder or kidney infection is confirmed, your veterinarian will prescribe antibiotics. Usually antibiotics are continued for six to eight weeks (a longer term than would typically be used for a non-diabetic UTI). 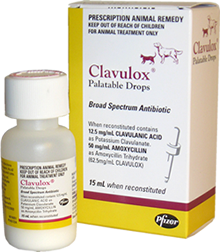 The ideal antibiotic will depend on the sensitivity results, but commonly used are amoxicillin/ clavulanate (Clavamox®), orbifloxacin (Orbax®) and marbofloxacin (Zenequin®). The urine culture will be rechecked following completion of antibiotics. UTI cats may urinate outside the litter box. Resolving the infection with antibiotics is the primary treatment for this cat behavior problem, but there are other things you can do to encourage your kitty to use the box. Make sure there are a sufficient number of litter boxes: one per cat plus one, with at least one box on each level of the home. Provide a selection of litter types: unscented clumping, sand, pearls, or recycled paper. Consider taking the lid off covered boxes, and make sure that the box is large enough for the cat to move around comfortably. Many older cats have arthritis of the hips and spine; modifying the box to have a low entrance can be helpful for cats experiencing pain. Make sure that the boxes are kept scrupulously clean. If your cat goes on the floor next to the box, you can put down a puppy potty pad to absorb the urine. Areas that have been soiled by cat urination should be cleaned well with an enzymatic cleanser (such as Nature’s Miracle®) to break down the odor. Sometimes cats who have had bladder infections develop anxiety relating to urination and stop using the litterbox. Your veterinarian will want to make sure the infection is under control, but if she determines that anxiety is the cat’s problem, anti-anxiety medications such as fluoxetine (Prozac®), clomipramine (Clomicalm®) or amitriptyline (Elavil®) may be used. Another option is a feline stress-relieving pheromone (Feliway®), available as a plug-in diffuser, room spray, or collar. If you’re ever suspicious about your cat’s urine, taking a sample to your veterinarian is a simple first step.